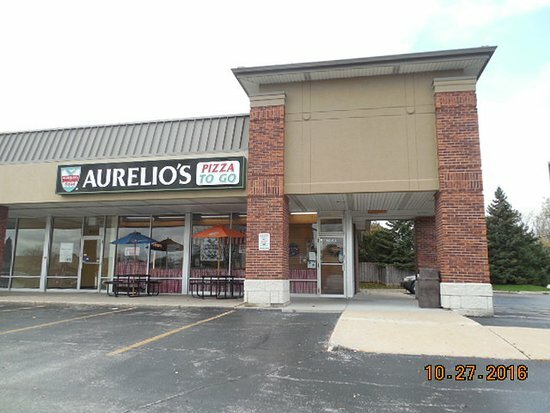 Non ci sono ancora valutazioni sufficienti per cibo, servizio, rapporto qualità-prezzo o atmosfera per Aurelio's Pizza, Illinois. Scrivi una delle prime recensioni! Breaded Italian mozzarella cheese sticks, served with a side of marinara for dipping. Eight chicken wings, served with your choice of dipping sauce. Buffalo or BBQ style, served with ranch or bleu cheese. Breaded jalapeno peppers stuffed with cream cheese, served with marinara sauce. A bed of lettuce topped with ham, mozzarella cheese, pepperoni, green and black olives, sweet red peppers and pepperoncini. House dressing recommended. Crispy romaine lettuce and shaved parmesan cheese, tossed with our classic dressing and herbed croutons. Mixed lettuce with chicken, bacon, ham, cheddar cheese, egg and diced tomato. Fresh and crisp iceberg and romaine lettuce tossed with sweet red peppers topped with herbed croutons. All sandwiches come toasted with potato chips and pickle. We've been toasting our sandwiches since 1959! Tender and delicious Italian beef served on a fresh toasted roll. Fresh homemade Italian sausage broiled to perfection and served with red sauce on a fresh toasted roll. Fresh homemade Italian sausage and Italian beef served on a fresh toasted roll. Imported ham thinly sliced and piled high, served with lettuce and tomato on a fresh Italian roll. Aurelio's very own homemade sauces over your choice of fresh cooked pasta. Choose your sauce and pasta to create your perfect meal. Lil 6", the works — sausage, cheese, green pepper, ham, pepperoni, mushrooms. Small 10", the works — sausage, cheese, green pepper, ham, pepperoni, mushrooms. Medium 13", the works — sausage, cheese, green pepper, ham, pepperoni, mushrooms. Large 15", the works — sausage, cheese, green pepper, ham, pepperoni, mushrooms. Fiesta 18" the works — sausage, cheese, green pepper, ham, pepperoni, mushrooms. Lil 6", Aurelio’s blend of fresh spinach and spices. Small 10", Aurelio’s blend of fresh spinach and spices. Medium 13", Aurelio’s blend of fresh spinach and spices. Large 15", Aurelio’s blend of fresh spinach and spices. Fiesta 18", Aurelio’s blend of fresh spinach and spices. The original family recipe that has made Aurelio's famous! Thick and crispy made fresh daily with your choice of toppings. Create your own calabrese with our delicious ingredients inside a golden brown hand-closed crust. A delicious alternative to traditional pizza. Aurelio’s famous crust stuffed with mozzarella cheese and fresh spinach marinated in mama Aurelio’s secret seasoning and special marinara sauce then baked until golden brown. Made the old world way with our special sauce and crust. Start with our classic cheese and build it the way you like. Our gluten - free crust is made by kinnikinnick foods, a gfcf certified wheat and gluten - free facility. We do however follow strict guidelines in preparing our gluten - free products. Start with our classic cheese and build it the way you like. Si tratta di una tener fuori luogo in un centro commerciale di strip su 127e Ridgeland. ottima pizza, zuppe e altri oggetti. Servizio veloce e prezzi ragionevoli. Questa è la pizza eccellente ma era meglio avere un buono come i prezzi sono molto alti. Questa è una palestra e il cibo è generalmente pronto in 20-25 minuti. Mi è capitato spesso di andare a visitare questa località un sacco per il pranzo ed ottenere una fetta di pizza. Sono sempre molto efficiente ed ottenere il mio ordine per me. Il cibo è di buona qualità e sempre caldo quando ho capito. Ricevi risposte dal personale della struttura Aurelio's Pizza e dai visitatori precedenti.